I would like to thank the publisher, Harper Collins, for sending me a copy of this book in return for an honest review. Carmel Harrington's books have become the release that I look forward to the most every year, so you can only imagine my excitement when this book came through the letter box. Of course, the second I opened the envelope, I had to drop what I was doing and get stuck into this book straight away, knowing that this book would bring all of the emotions with it, the give away being the tissues that accompanied the book. I am so pleased to say that this book is all that I expected and more. Stella has not had an easy life, so when she met her husband and he swept her off of her feet, she though it was too good to be true, and that's because it was. A year later, Stella finds herself stuck in an abusive marriage with no way of escaping her husband, who both mentally and physically abuses her on a regular basis. Rea lives next door and is the woman at 72 Derry Lane, who is hiding a big secret that means she has developed a mental illness that has seen her lose everything and leave her housebound. When she realises what is going on next door, Rea strikes up a very special bond with Stella and is determined to help her to escape her abusive marriage and see her husband be brought to justice. The third woman that this book focuses on is Skye and her story takes us back to the St Stephens Day Tsunami, leaving the reader with heartbreaking scene that will chill you to the core. From the second I opened this book and started reading I could tell that Carmel has but her heart and soul into writing this book and bringing these amazing characters to life. At times it was hard to read as scenes from the tsunami and the abuse that Stella suffers at the hands of husband are hard to read, but I still couldn't draw myself away from this story and I read it at record speed. There wasn't one single thing that I disliked about this book and I really can't find one fault with it. After reading it, it is so easy to see how it is flying up the charts, as it deserves this and so much more. 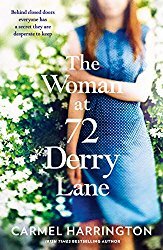 The Woman at 72 Derry Lane is probably my favourite book of 2017 so far, because it made me laugh and cry, sometimes both at the same time, and at the same sentence. This book came into my life at a very emotional time for me, so i felt every single emotion that all three of the women felt, leaving me feeling so sad, upset, angry and happy at the same times as the characters were. You will not find a better book this year and I really cannot recommend that you read this book enough.